← 80. Torphins. 25 June 2018. The Home of Golf – thanks especially to The Champion Golfer of 1995, Mr John Daly! WOW! 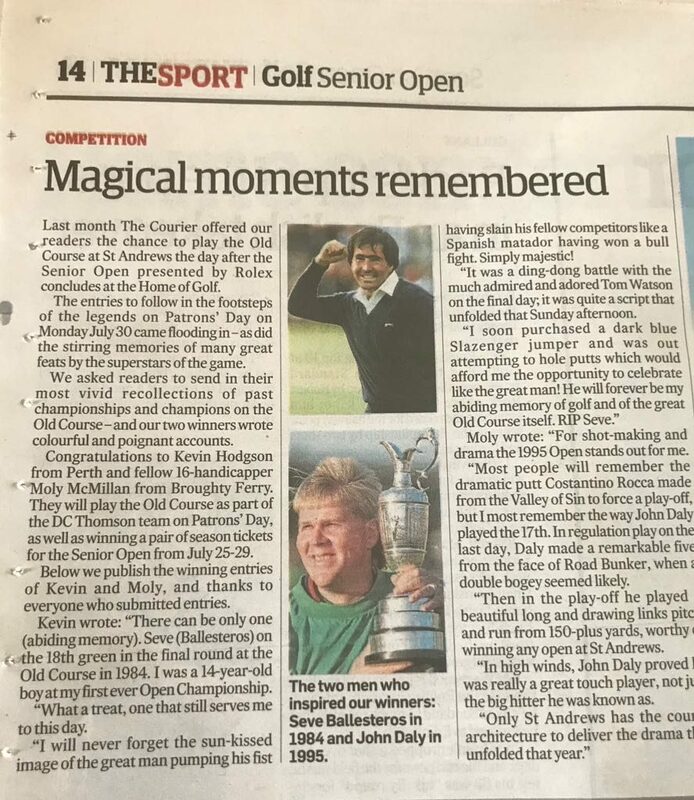 A few weeks before playing at The Old Course, I received a surprise call from Richard Rooney of D C Thomson, the Scottish Media conglomerate; “Congratulations, Moly, you’ve won our St Andrews Memory competition run by The Courier newspaper. The prize includes joining the D C Thomson 4 ball in the Rolex sponsored “Patrons Day” on the Monday following the Senior Open”. WOW! The Auld Toon of St Andrews provides the backdrop to Moly playing at the 16th from just in front of the “Principals Nose” bunker. I’d actually forgotten I had entered a competition some weeks earlier, but no matter, there I was standing on the Championship 1st tee at 8am on Monday 30th July 2018, only about 40 yards from where Miguel Angel Jimenez was crowned the Senior Open Champion a little over 12 hours previous. WOW! 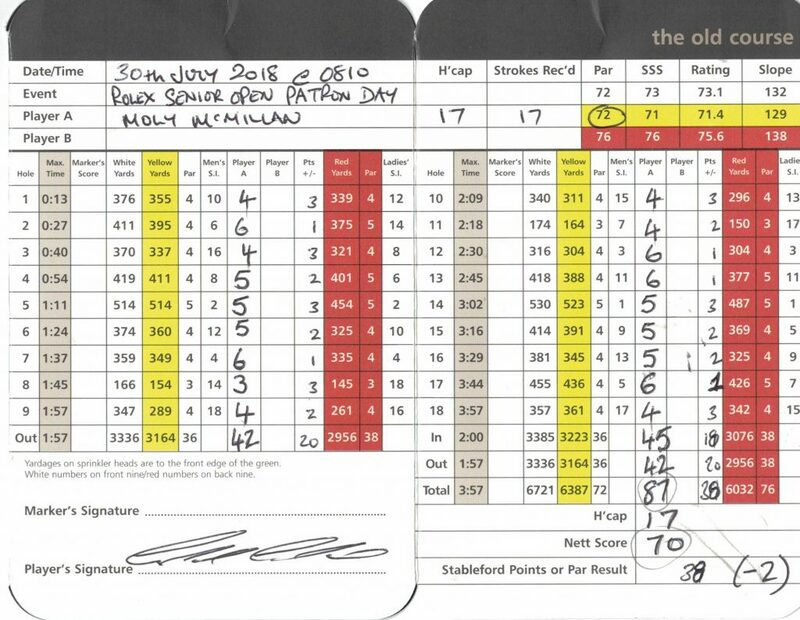 The Courier report of the Competition which won Moly his Old Course round. Thanks John! 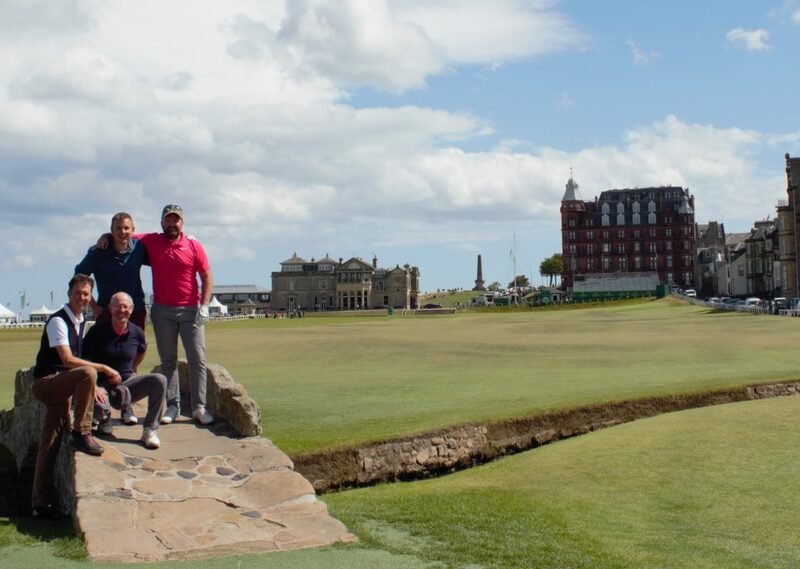 Assisted by local caddie, John, from Kingsbarns, and along with Keve Hodgson, fellow winner, and our 2 D C Thomson hosts, conveniently both called Richard, we played The Old Course in beautiful links conditions (a fair westerly breeze), using the Sunday pin positions. WOW! I shot a stroke-play 87, including 8 pars, with the same ball. WOW! 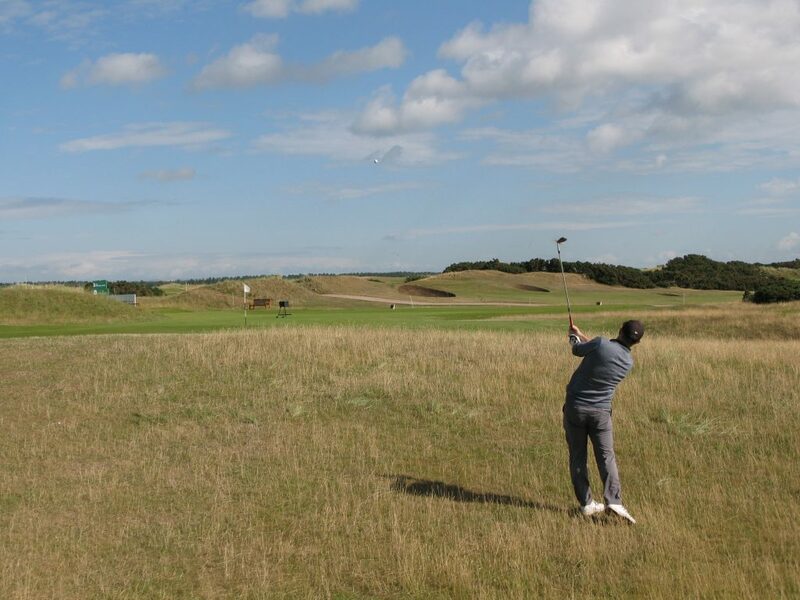 Including par 4s at the 1st and 18th, from the championship tees, the 18th where I played a 150 yard 6 iron into the breeze to only 15 feet, with Caddy John announcing as my ball launched “its all over it!” and received a round of applause from the 30 or so spectators milling around. 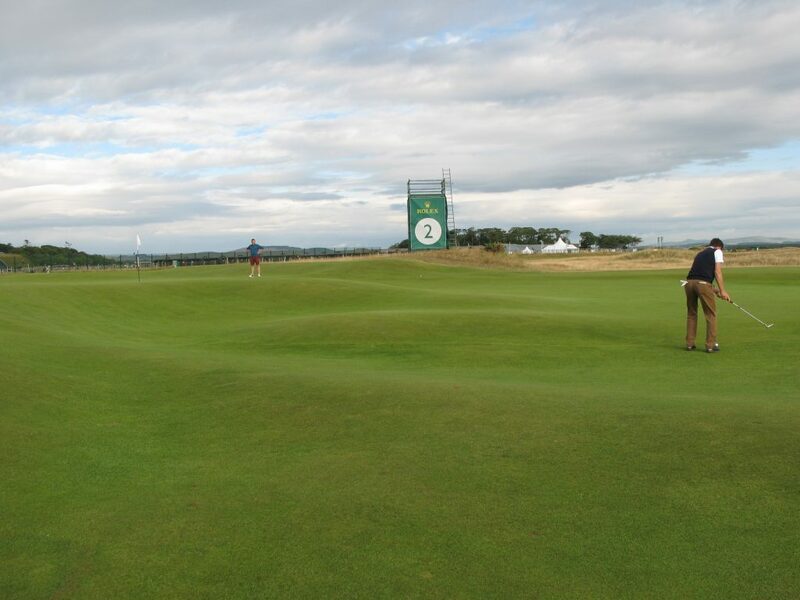 Putter in hand, the walk to the green was “golfing heaven”. WOW! “This is the origin of the game. This is golf in its purest form and it’s still played that way on a course seemingly untouched by time. Every time I play here, it reminds me this is still a game.” – Arnold Palmer. 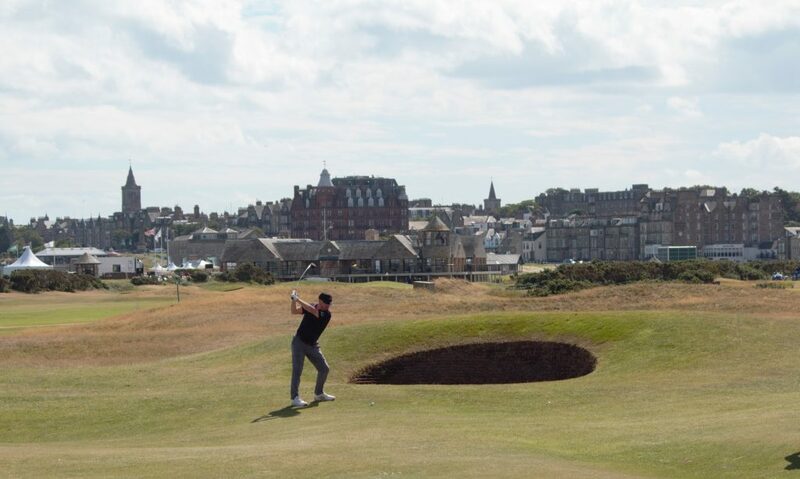 I’ll therefore use this blog to discuss the concept of value, the prime measure I make of Scottish golf courses, which takes on an added mystery when applied to the Old Course at St Andrews. It’s by no means the most difficult course in the world, or anywhere near the most expensive; albeit at £180 its not cheap. 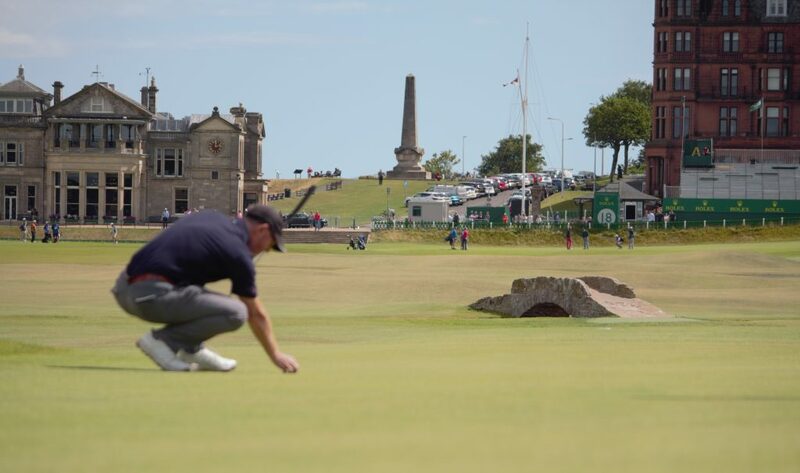 However, it’s arguably the most accessible great sporting location in the world – anyone is free to walk its hallowed turf on Sundays when the course is closed to play. By all accounts, turn up on Christmas day and play for free (without the flags though!). Lining up a putt for bogie at 17, with the iconic backdrop. Oh for the day to go on and on…. In deciding how to assess its value, I came up with this conundrum. 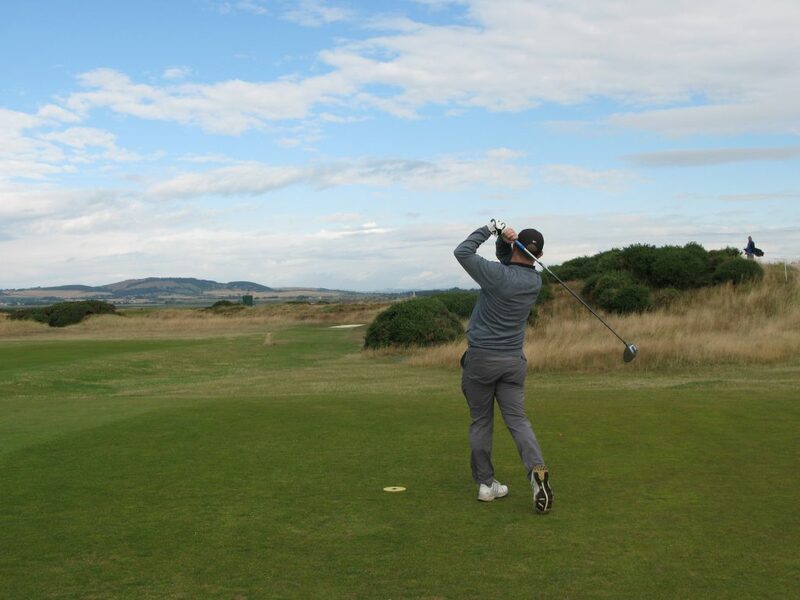 Ask any golfer the world over this question: “Regardless of price, you can play golf once only in your lifetime at either The Old Course or Course X (name any course) – which would you choose to play?”. Other than perhaps Augusta, The Old Course would likely come out top every time. Therefore, for me, this defines the top price one should pay for a round of golf anywhere. Any course costing more than £180 can’t be worth it, by definition, if you would actually rather play the Old Course anyway instead, regardless of price. Of course, its only my opinion! The beautiful par 4 7th hole, short at only 359 yards (white), but a true SI 4 hole. So, play it once in your lifetime. Hire a caddy if you can afford to. Walk the hallowed turf and pray that you hit some nice shots. Hope for a nice day, but also hope that the wind gets up sufficiently to understand its defence. Hope for some “Sunday pins” to wrestle with a pro’s dilemma. Hope you (maybe) find one or two of the almost mythical bunkers that dot the course. Hope…..for so many things! I only found one bunker, Hill, on the par 3 11th …..thank goodness:) I made a miraculous bogie, which was somehow symmetrical, as it was John Daly’s miraculous bunker shot from “Road” bunker, that won me the round of golf! WOW! Moly’s Hope; a well played round of 87 at The Old Course, St Andrews. This entry was posted in 18 holes, 5 star, 5 star, Before 1850, Course Architech, Course Owned By, Course Quality, Course Type, Holes, Links, Local Authority, over £100, Overall Value, Price, Region, The Kingdom of Fife, Unknown, When Course Established. Bookmark the permalink.